Chlorine Chemical Storage - FIREloc - The Perfect Storage Solution. What is Chlorine and What are the Potential Hazards Associated with it? Chlorine is used in many different household products in a liquid state, although its pure chemical element has the physical form of a poisonous yellow-green gas. Chlorine gas has a suffocating odor and is extremely toxic. Chlorine, in a liquid and solid form, is a powerful oxidizing agent. More commonly known, chlorine is a very important chemical used in water purification, bleach and disinfectants. Chlorine is found in many products including paper, foods, insecticides, paints, plastics, solvents, cleaners, antiseptics and other consumer products. Chlorine is a highly reactive substance and is mainly found in industrial operations. The corrosive substance is known for burning tissue on contact and chlorine’s gas form can be lethal if inhaled. Oxidizing substances, such as chlorine, can react to combustible and flammable chemicals, creating a fire or explosion. This chemical reaction can occur from room temperature, heating, any type of ignition source or from storing incompatible materials in the same storage room. Chlorine chemical storage buildings by US Chemical Storage. The chemical chlorine should be stored separately in a completely sealed chemical storage building. Avoid storing chlorine with combustible materials, flammable materials, bases, halogens, reducing agents and metals. US Chemical Storage offers compliant chemical storage buildings that are designed by professional engineers for quality assurance. FIREloc series chemical storage buildings are designed to house flammable chemicals 10-30 feet away from occupied facilities or property lines (check with local authorities for variance allowances). 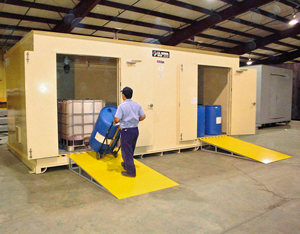 Compliantly store chlorine and other hazardous materials safely with 2-hour fire-rated FIREloc chemical storage building. Built from heavy-gauge steel and perfect for storing flammables, combustibles or other hazmat. These 100% customizable buildings offer climate control for temperatures ranging from -20°F to over 175°F. Customize your FIREloc chemical storage building with racks, stainless steel shelving, mechanical ventilation, gas sensors, flooring options, explosion relief panels and more to safely maintain your chlorine chemical storage. All FIREloc chemical storage buildings offer a 15-year structural warranty and a chemical or corrosion resistant epoxy top-coat – perfect for storing chlorine chemical storage. Our chemical storage buildings offer unmatched strength and durability features that our competition simply cannot match. Meets EPA, OSHA, NFPA and FM approvals or Warnock Hersey standards. Compliantly store your chlorine chemical storage with a safe, dependable and 100% customizable chemical storage building by US Chemical Storage.